With over a million contactless payments happening in the UK today, it's no surprise that a hefty amount of contactless cards are starting to amass in your wallet, and that could be a problem. Card clash is becoming more of an issue; with organisations like Transport for London now accepting contactless payment, it's all too easy to pay with the wrong card. On many occasions you'll swipe your wallet on a reader to pay for something and the reader will either come up with an error message, or even take payment from several of your cards, which is pretty irritating. Identity theft is also a problem with your contactless cards as thieves can carry portable card readers and lifting your card info straight from your pocket. 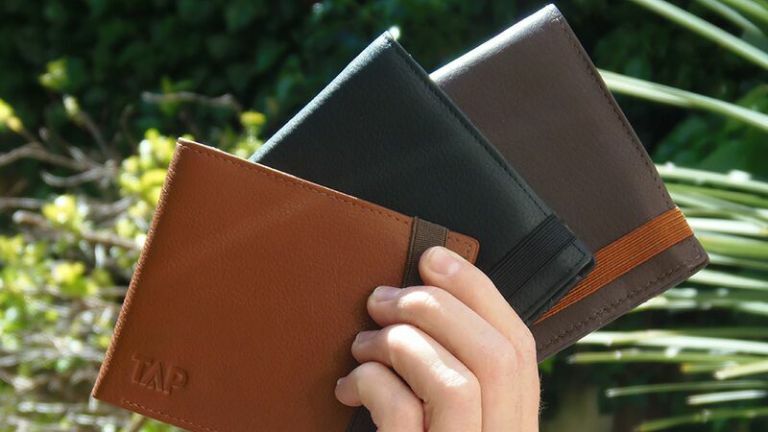 Entrepreneur Dan Chapman has launched a Kickstarter for a new wallet that protects you against card clash and identity theft, whilst still allowing you to use your choice of card without lifting it out. So you can be lazy yet safe at the same time. The Tap Wallet means you choose a card to put in the outer pocket, enabling you to pay for things with that card whilst all the others are protected using blocking technology. The only slight snag with this product is that you'll have to change over your primary card if you use more than one payment card on a daily basis.